Little Rock Sometimes it helps to get a gentle reminder of what we know, but don’t always practice. At our union we live and breathe “majority unionism” by which we mean trying to organize as many workers as we can, in as many ways as we can, with or without demanding direct recognition or collective bargaining, but by trying to organize workers to be union members where they work to protect and advance themselves, act collectively, and build power on the job. Some people call this minority unionism because the union does not have exclusive representation rights on the job which are common in collective bargaining agreements in North America, though this strategy of direct membership recruitment is common in many countries around the world from France to India and beyond. 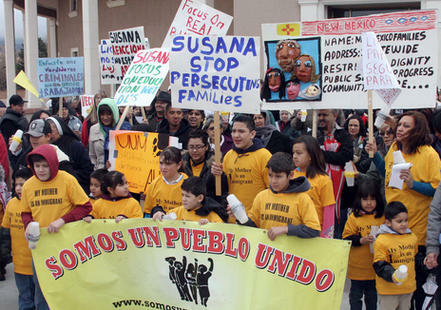 A piece by Steven Greenhouse, the former labor reporter and now freelancer for the New York Times, recently detailed the success that Somos Un Pueblo Unido, a 20-year old immigrant rights group was having in Santa Fe and elsewhere in New Mexico by assisting in organizing workers’ committees and winning important victories for workers in low wage and service industry jobs that are largely non-union, but desperately need protection and organization. The committee structure allows the workers to trigger the protections for collective action provided by the National Labor Relations Act for workers acting as a group that is not available to individually aggrieved workers. Few civilians realize that the NLRA offers virtually no protection for unions, but lots of protection for workers, especially when they are engaged in concerted activity. “A lot of people thought the National Labor Relations Act could be used only during unionization campaigns,” said Andrew Schrank, a labor relations specialist who recently became a professor at Brown University after teaching at the University of New Mexico. “They’re finding that the National Labor Relations Act is much more expansive than many people thought.” Richard F. Griffin Jr., the labor board’s general counsel, said a 1962 Supreme Court case — involving a spontaneous walkout because a factory was so cold — makes clear that the National Labor Relations Act protects nonunion workers, too. “It’s important that people understand that the law applies to all private sector workplaces and protects activity outside the context of union activity,” Mr. Griffin said. Somos has put together a good track record using these tools thus far. They have filed charges with the Phoenix office of the NLRB in 12 cases, and 11 complaints of unfair labor practices were won for workers as diverse as carwash attendants, hotel housekeepers, and restaurant workers. Needless to say perhaps, Somos has won reinstatement for many of these workers along with backpay. Not only that but in many cases once the workers have organized they have also realized they were victims of wage theft and other labor violations leading to some six-figure settlements paid out to workers from employers for violations of the Fair Labor Standards Act as well. Supposedly other workers centers in other cities are taking a look at the Somos track record. For our part we’re glad to have fellow travelers after all of these years, and it helps us hew to this path of direct organizing to win power on the job now with or without the employer’s consent but using all the tools we have at our disposal from citizen wealth to direct unionization. In my organizer’s Spanish I think Somos Un Pueblo Unidos means All the People United. It’s hard to imagine a better slogan for working men and women in any language. New Orleans The National Labor Relations Board (NLRB) took a step that might be small, but at least seems in the right direction. They have solicited legal briefs, and no doubt there will be many from both the union and management side of the bar, on the question of dues or fee obligations for nonmembers in private sector employment who are represented by the union in grievances and disputes. This may seem like a small thing to the general public, especially since so few workers are now represented by unions in the private sector, hardly more than one in twenty, but the amount that it rankles anyone who understands the issue is huge. This problem also only affects the subset of workers in the half of the United States that live in right-to-work states which means even fewer of those workers, but that’s still a big number. really “wins” are the rights to attempt to bargain a contract over a twelve-month period, if done in good faith, and the fact that the employer cannot legally challenge the union’s majority for that period. The union under US labor law is the “exclusive representative” of all of the bargaining unit workers.All individual deals that an employer might try to cut with a worker, no matter how favorable, are illegal, because of the exclusivity of the union’s representation. Any issue involving wages, working conditions or terms and conditions of employment must be exclusively handled through the union. around and, worse, the stories of it crippling entire local unions are legendary, and the number of DFR or duty of fair representation cases filed before the NLRB on such cases are numerous. Talk about false entitlements! Professors commenting on the NLRB’s initiative are already clear that there is nothing in the Act or elsewhere that has ever barred some form of fee payment for members in right-to-work states who are accessing union services. If there is no legal bar to instituting a new system, then we’re only left with the ideological and class objections that divide labor and management, so nothing new there under the sun. Even righting this contradiction and injustice won’t change the predicament that unions find themselves in, but it least unions would have a fair system in the workplace and a better shake representing private sector workers, no matter where they live in the country. A fix here will at least take the biggest devil out of the details of a union representing all the workers equally and exclusively.